FAIR GO: Newtown & Chilwell's Nic Fairchild sends down a ball against St Josephs last round. Geelong Cricket club faces a mammoth task this Saturday when it attempts to chase down Ringwood’s imposing score of 8/373. The visitors won the toss and batted on a vintage Geelong Cricket Ground wicket, wasting no time in asserting their dominance with some huge early partnerships of 70 and 191. The Cats’ bowlers toiled hard, with Brenton McDonald (3/80) bowling a quarter of the overs while Jake Reed (2/71) and Hayden Butterworth (2/77) sent down 21 overs each. The Geelong top order has been in fantastic form but will need all of that form as well a healthy bit of luck to chase this one down. 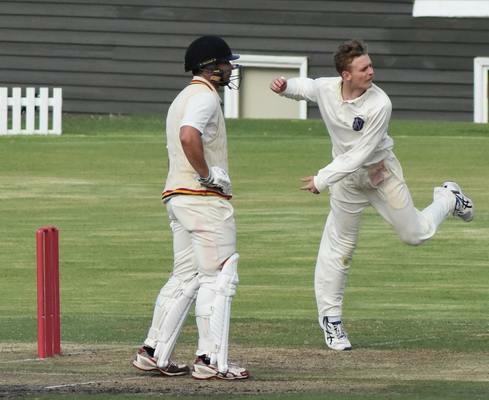 In Geelong Cricket Association, Newtown & Chilwell has sensationally dropped out of the top four after suffering a third loss in a row, this time at the hands of St Josephs. The Two Blues’ season is quickly starting to replicate last year when they charged out of the gates only to fade away after Christmas and miss the finals. They play Leopold at home this round and simply must win if they want to resurrect their premiership hopes. Nick McGuane has been leading the bowling group well but the batsmen simply have to stand up if the side wants to progress. Selections: LARA v South Barwon, Grovedale v ST JOSEPHS, NORTH GEELONG v Bell Post Hill, Geelong City v EAST BELMONT, NEWTOWN & CHILWELL v Leopold. In division two, Marshall just won’t go away, and after a great win over Highton last round will be looking to go one better against Manifold Heights, which is really struggling. The Bears sit in fifth spot, just three points outside the top four, and may well have an outright win in mind if they can bring their absolute best. For the Sharks, it’s been a tough season, but they’ve kept plugging away, and they would enjoy nothing more than claiming an upset win here to help finish their season in a positive way. Selections: St Peters v TORQUAY, MURGHEBOLUC v Bell Park, Thomson v HIGHTON, Manifold Heights v MARSHALL. And in division three, the top four might well now be set after Geelong West was unable to chase down Modewarre’s 186 last round. With star batsman Sam Loftus not playing, the Rams needed the rest of their batting order to step up and get the job done. Ken Spence (62) did his bit, while brother Tony also tried valiantly, but the rest of them couldn’t reach double figures, which left the side all-out for a disappointing 149. Fourth placed St Albans Breakwater does face the tough task of playing Bannockburn this round, so the door might be slightly ajar still for Geelong West but only if it can beat Teesdale first. Selections: Teesdale v GEELONG WEST, Newcomb & District v ALEXANDER THOMSON, GUILD SAINTS v Waurn Ponds-Deakin, MODEWARRE v Corio, St Albans Breakwater v BANNOCKBURN.